Capabilities include plasma enhanced chemical vapor deposition (PECVD), sputtering, thermal and e-gun evaporation, atomic layer deposition (ALD), silanization, electroplating, oxidation, sol-gel and spin coating. A wide range of thicknesses are possible from monolayers to 100's microns thick. The staff have the experience to provide guidance on starting conditions for most films and applications. 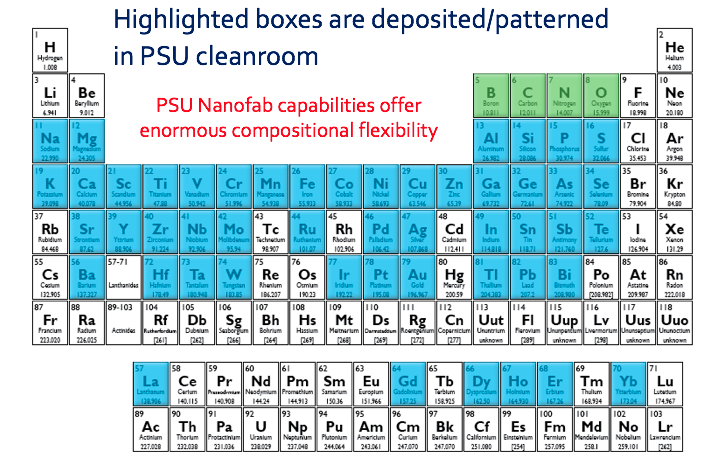 The Penn State Nanofab deposition capabilities offer enormous compositional flexibility. The range of films deposited within the Nanofab encompass over 50 elements on the periodic table as highlighted in the table below.